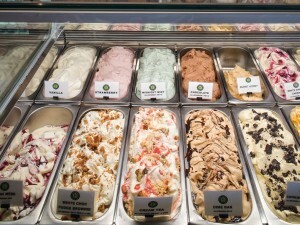 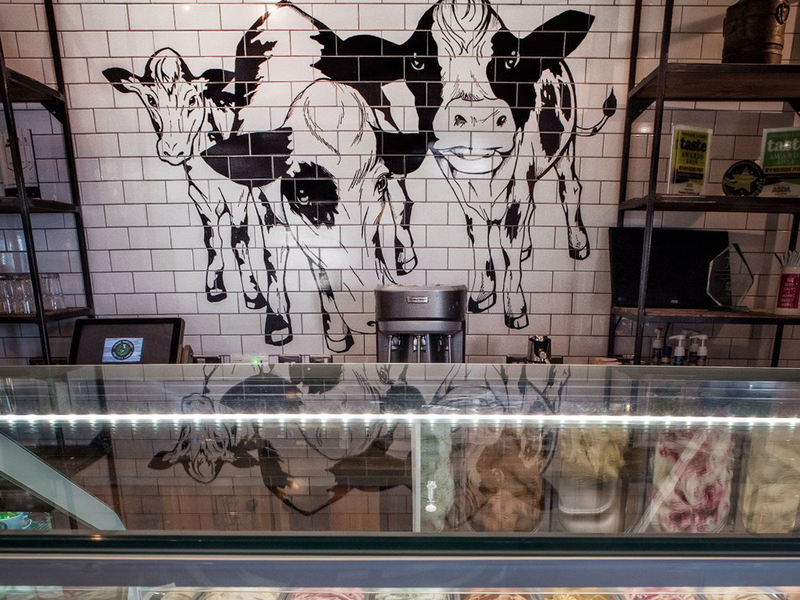 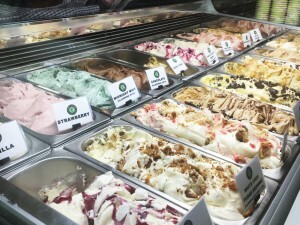 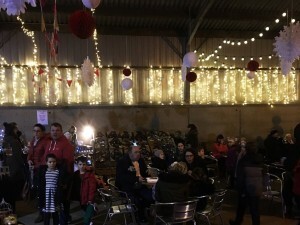 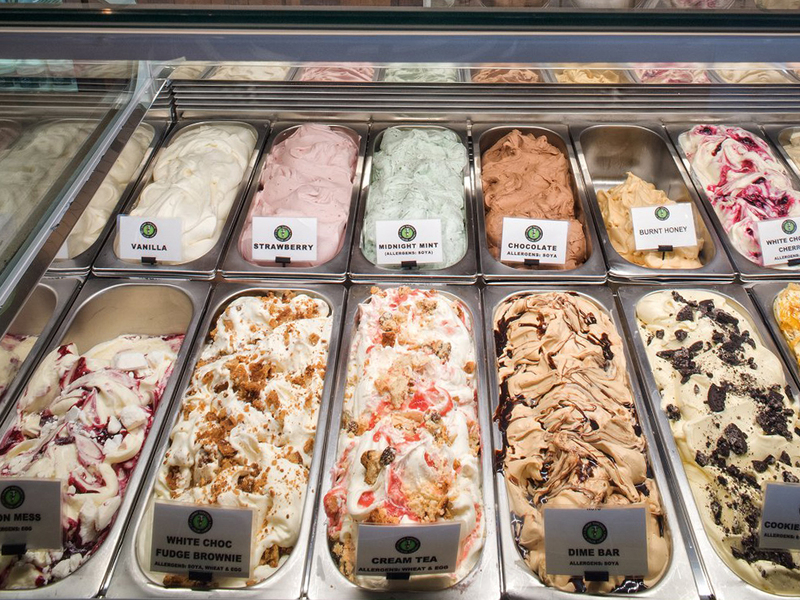 Delicious ice cream & food for all to enjoy! 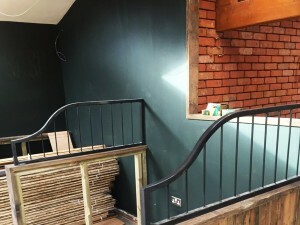 In addition to the Ice cream parlor the owners decided to create a new dining establishment which would feature our Olde Heritage brick slips prominently. 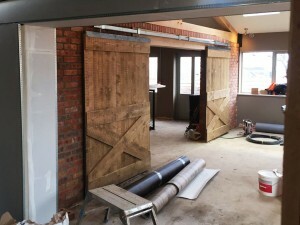 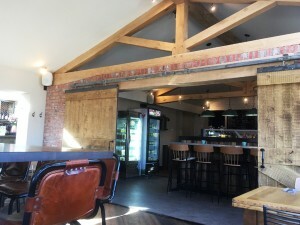 The Olde heritage brick slips were used throughout the 2 story commerical barn conversion and in the additional single story restaurant extension. 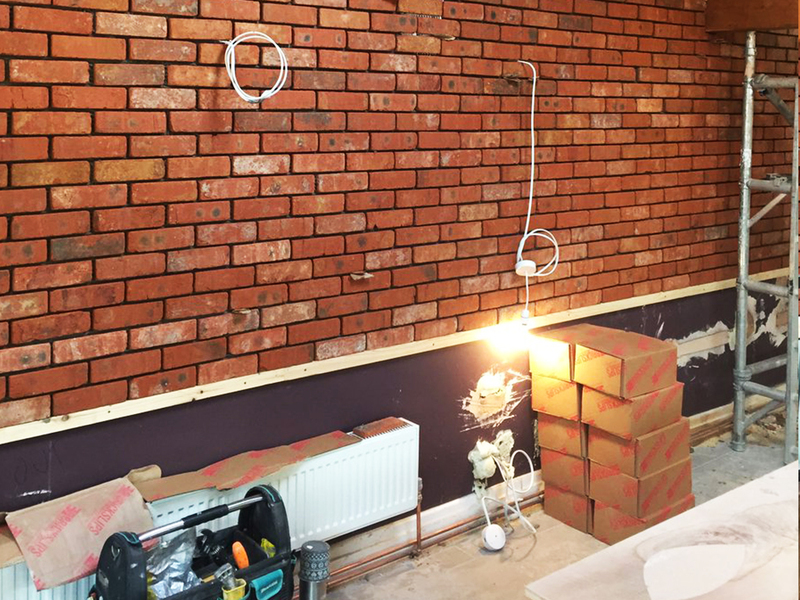 The brick slips were installed effortlessly across this generously sized feature wall using a rapid set adhesive and pointing mortar. 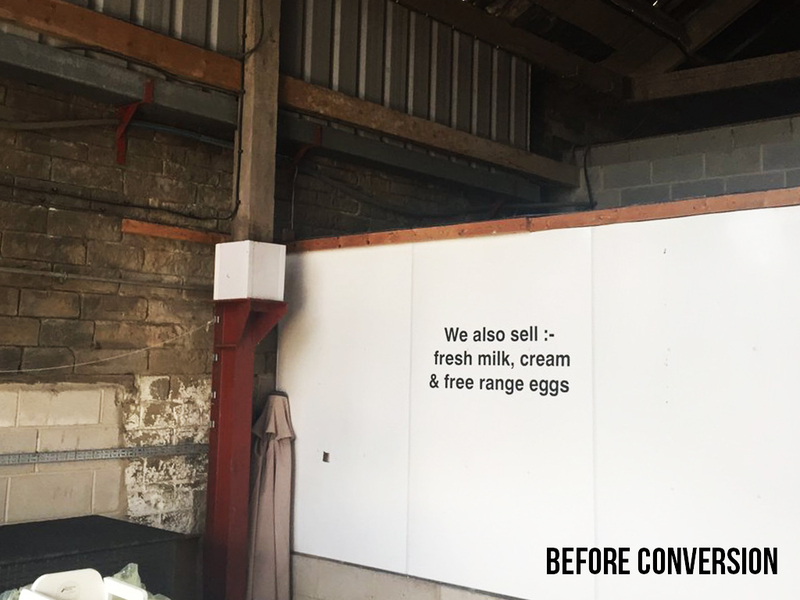 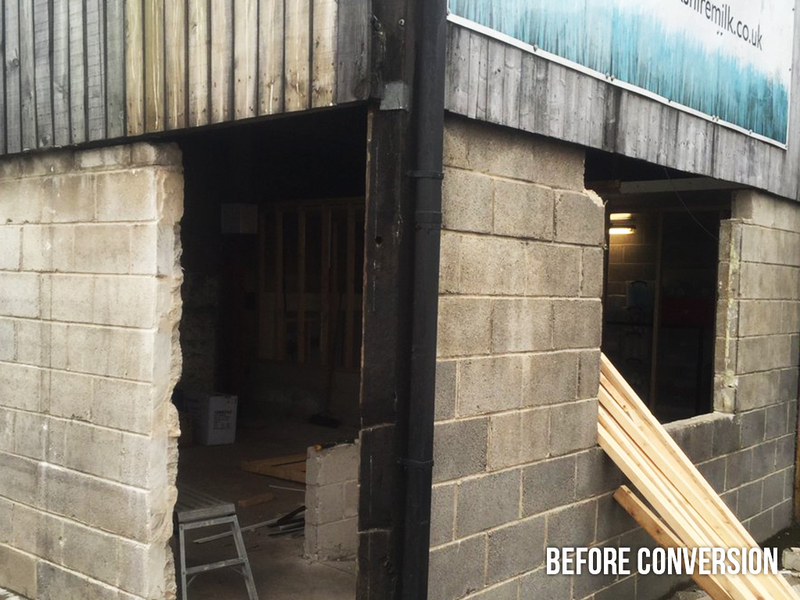 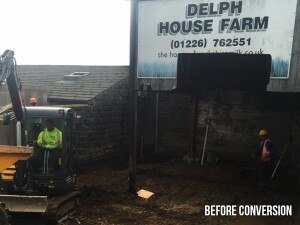 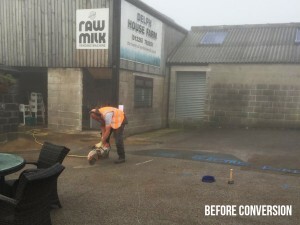 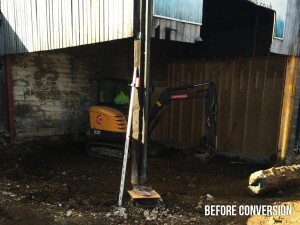 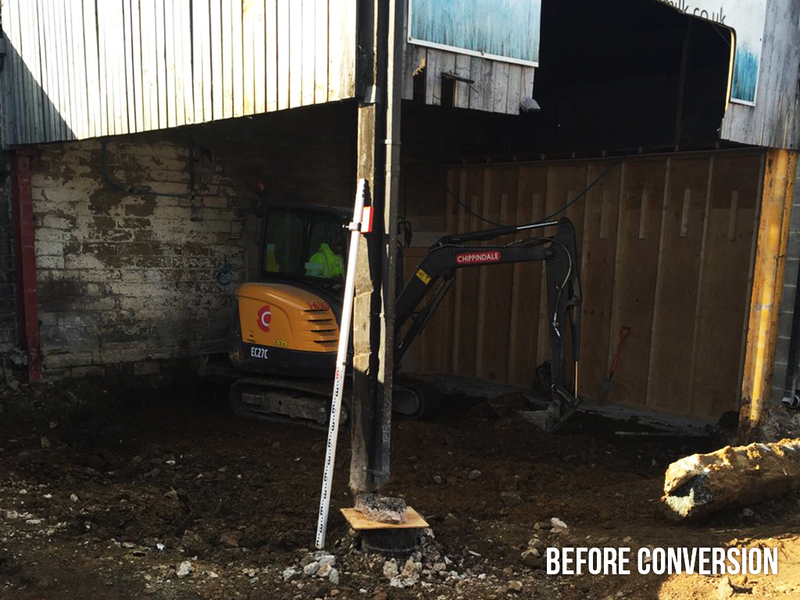 The before and after photographs of this wall and how different the brick slips look after they have been fully installed and given a final clean down. 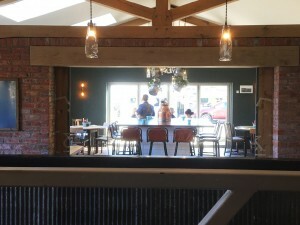 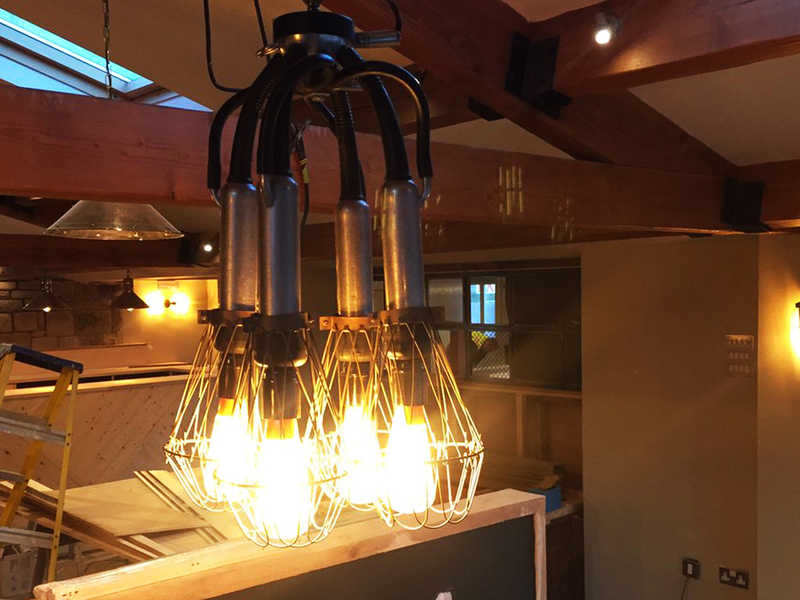 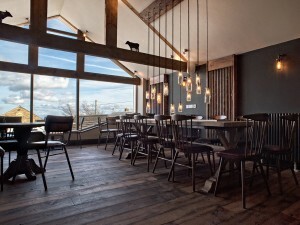 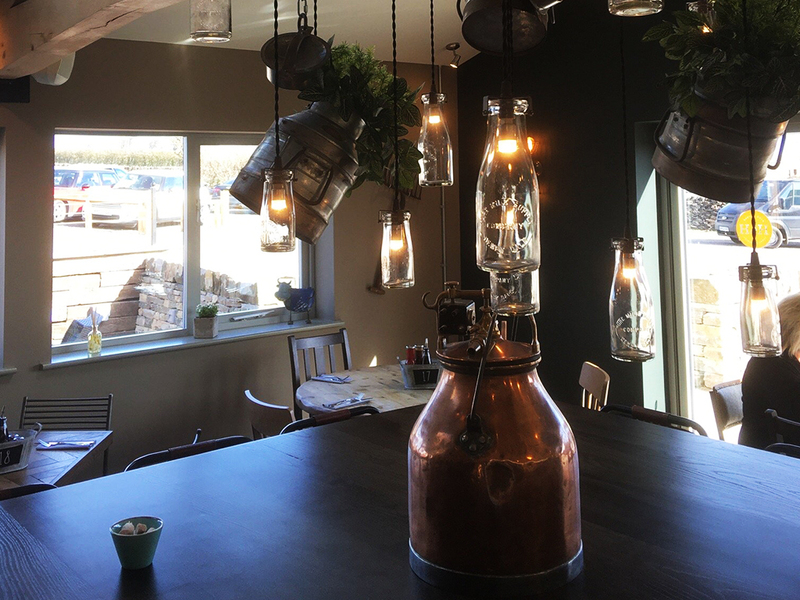 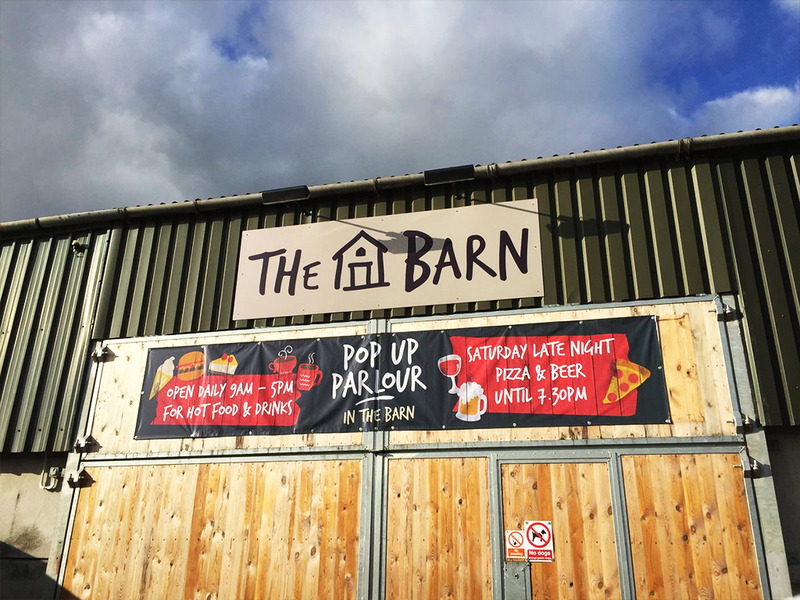 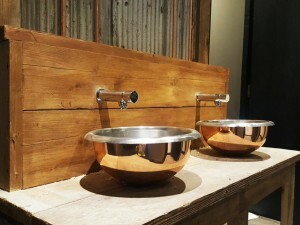 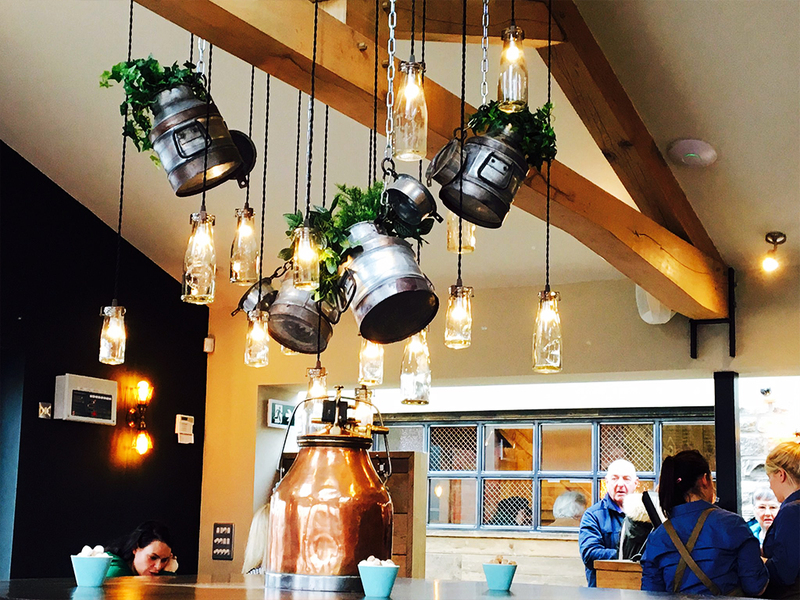 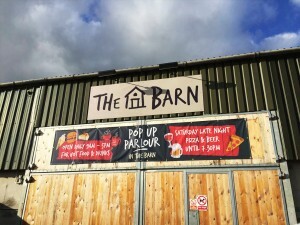 The almost medieval iron work displayed on the seating gives a real sense of rural attachment, paired harmoniously with the timber roof beams and stable hatches this installation really does give the diner a sense of earthy realism. The marriage of exposed reclaimed brick and natural rustic timber is just as perfect as strawberries and cream. 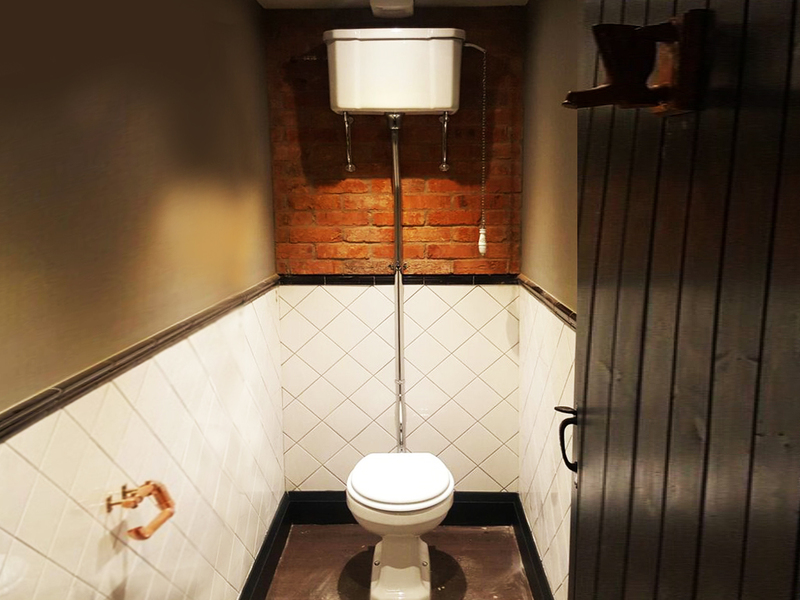 Traditional but yet perfect. 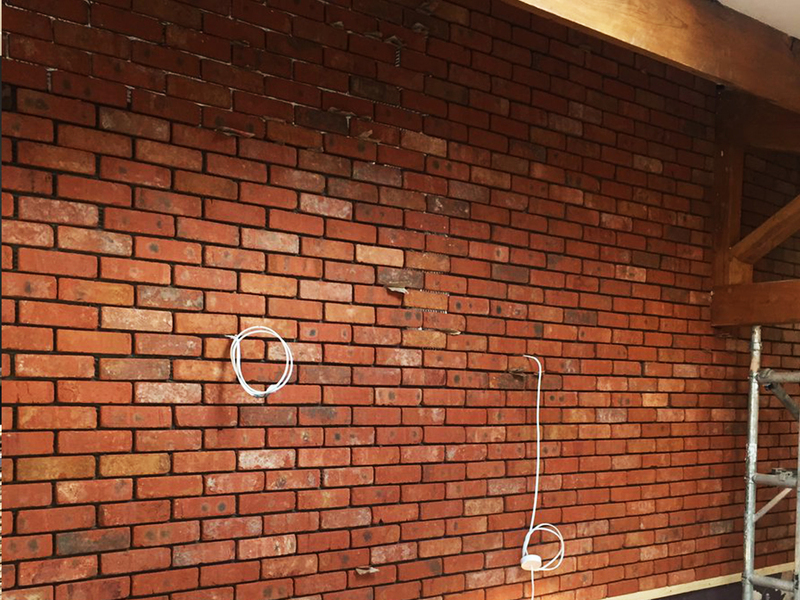 Choosing our Olde heritage brick slips for this particular project would not have been a problem for our client. 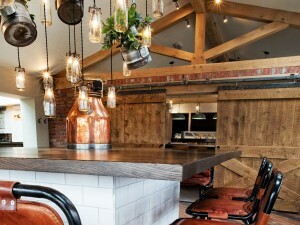 The brick is steeped in character and oozes rural appeal. Known for its mixed red tones and weathered face, this brick slip is at home within any rural or industrial setting. 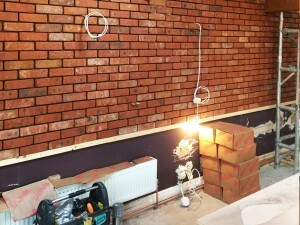 Once pointed with a light grey pointing mortar the Olde heritage brick slips allow the room to project it self in rich history. 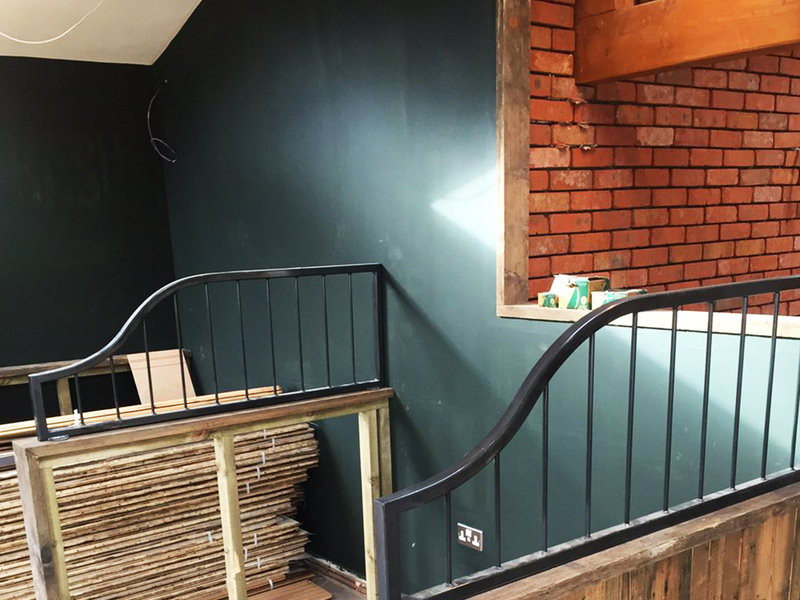 Here you can see the way our client has used our Olde heritage brick slip corners. 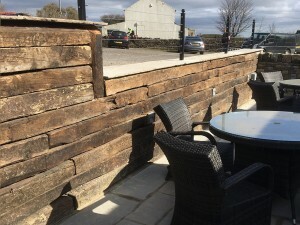 The corners curl around the wall edges of this grand opening fluently with ease. 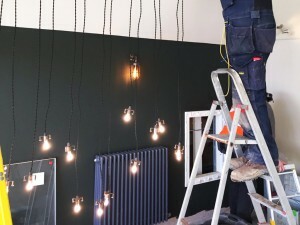 Using the corners in this way is pivotal in making the whole installation believable. 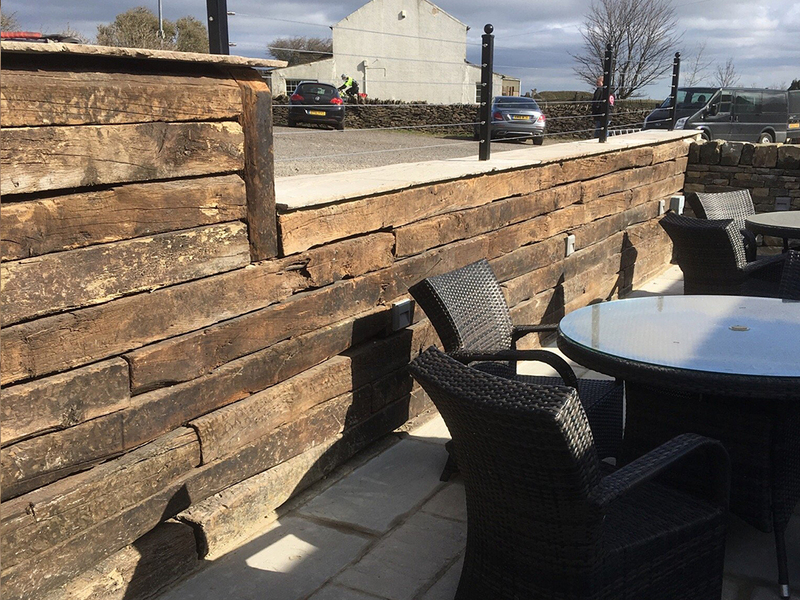 You want the diner to believe that this wall has witnessed decades of social interaction and played witness to many an occasion. 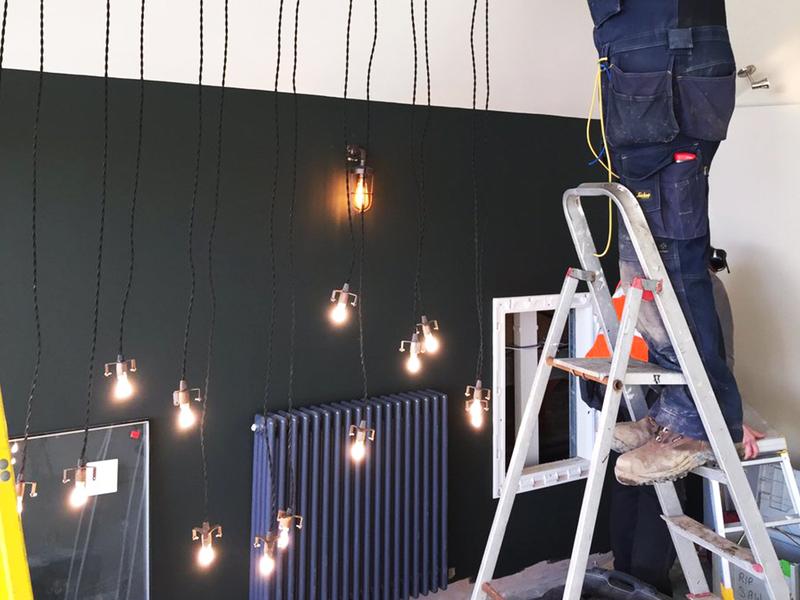 We like to imagine that all of our products allow the design process to evolve with ease, and we feel that with this project they have done just that. 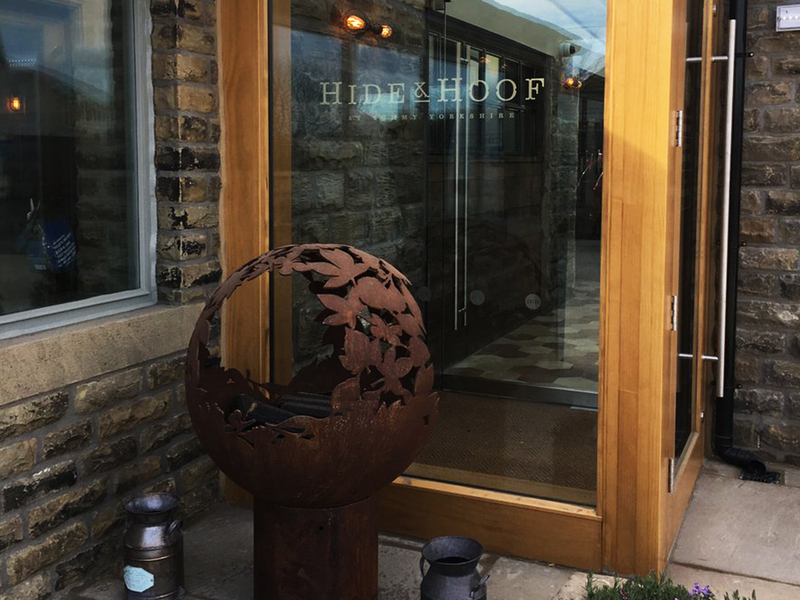 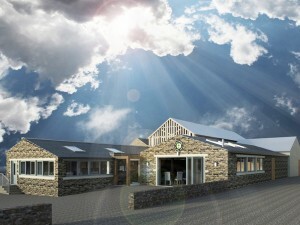 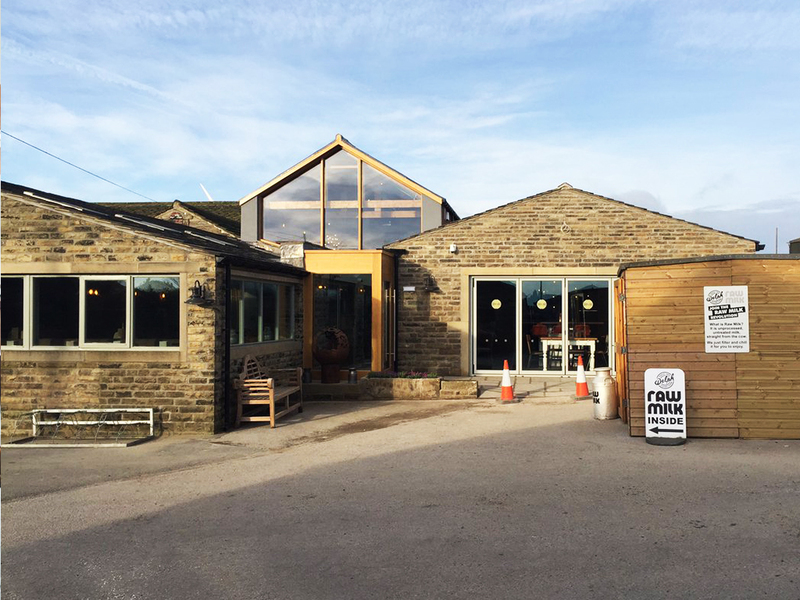 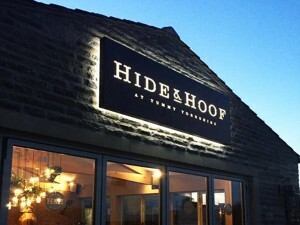 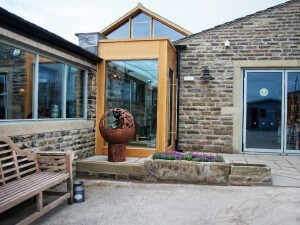 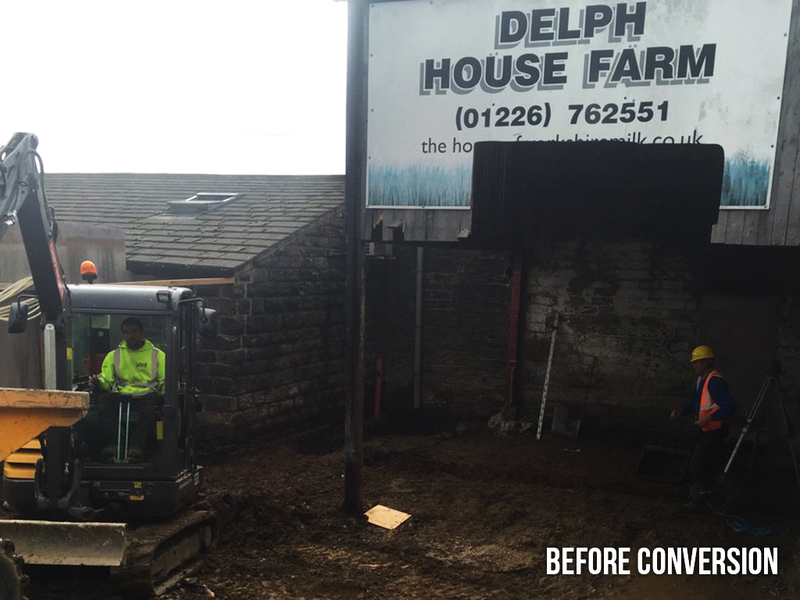 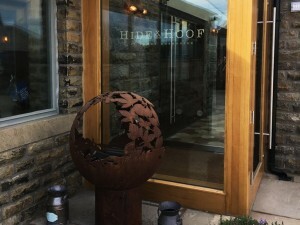 The Hide and Hoof Cafe and Restaurant at, Delph House Farm, Denby has been the result of hard work and determination by Yummy Yorkshire. 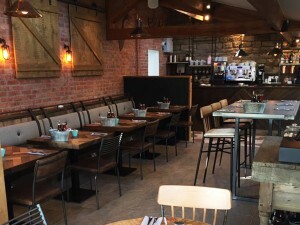 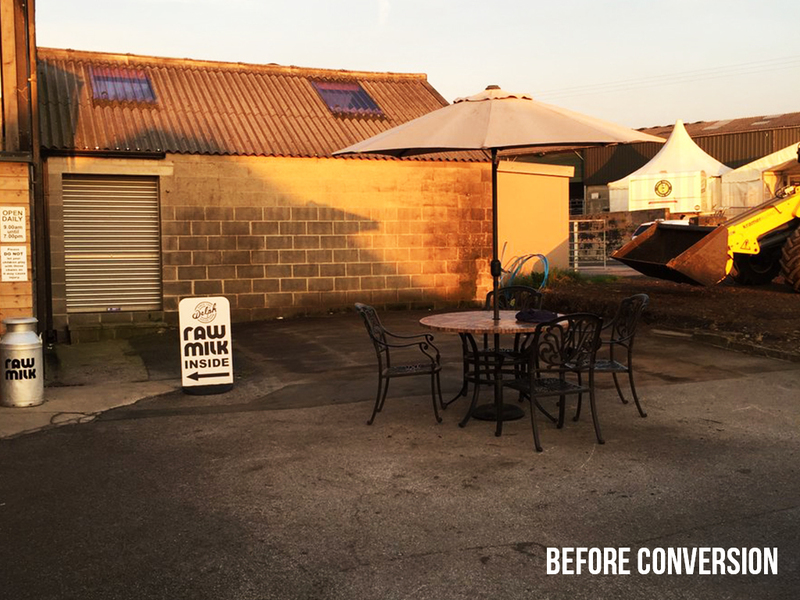 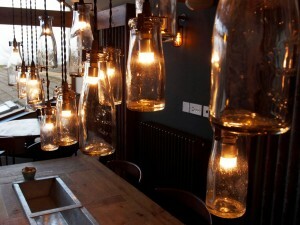 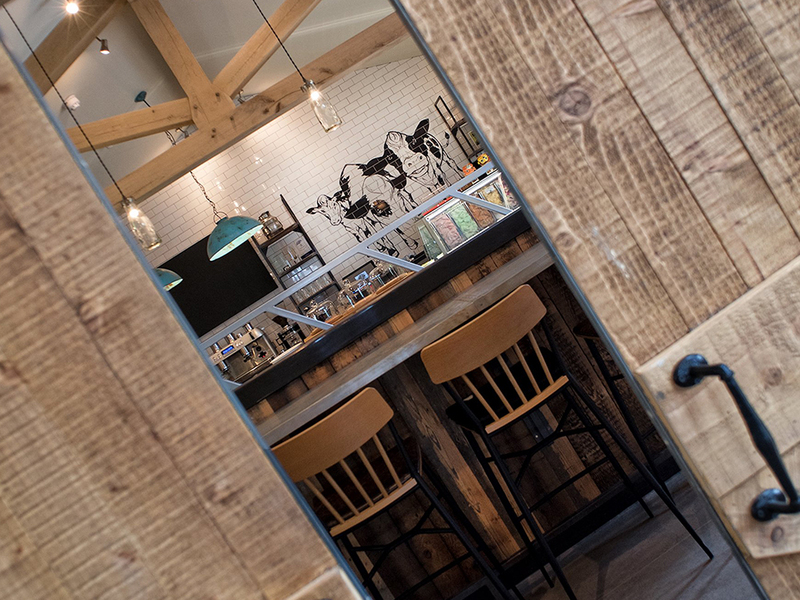 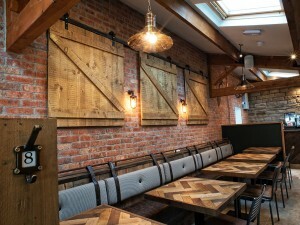 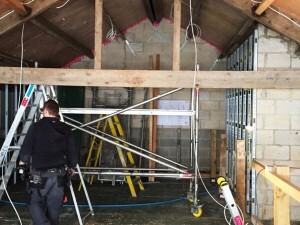 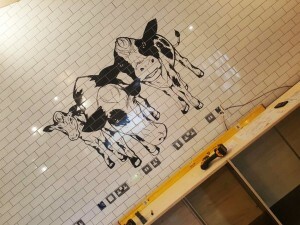 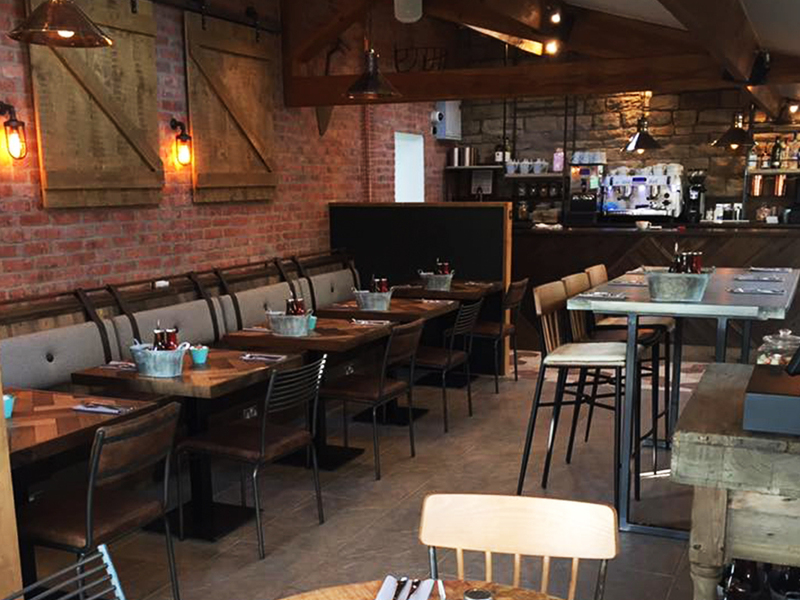 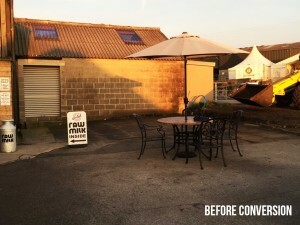 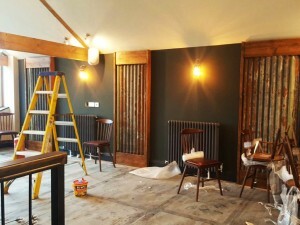 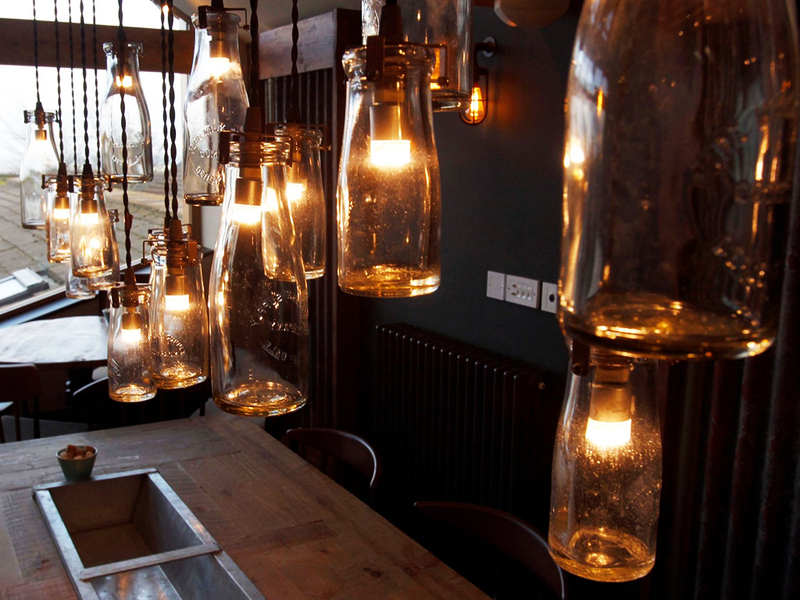 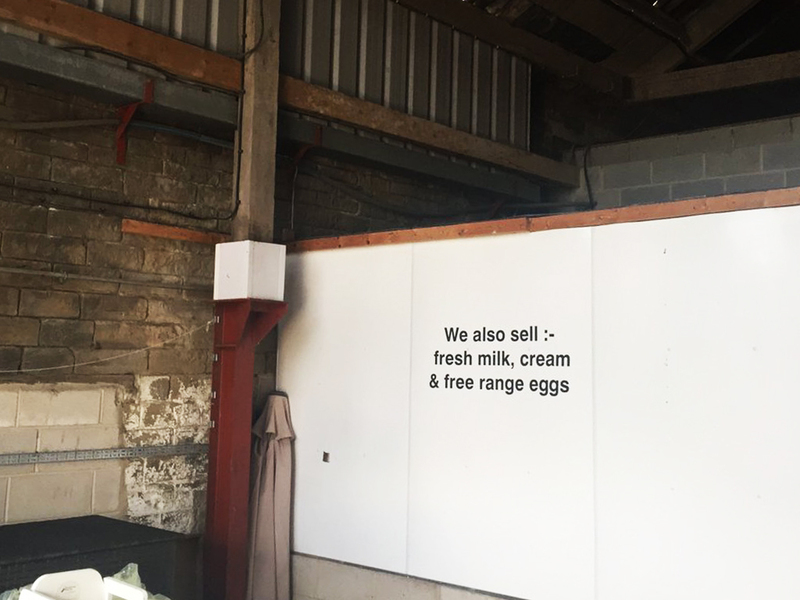 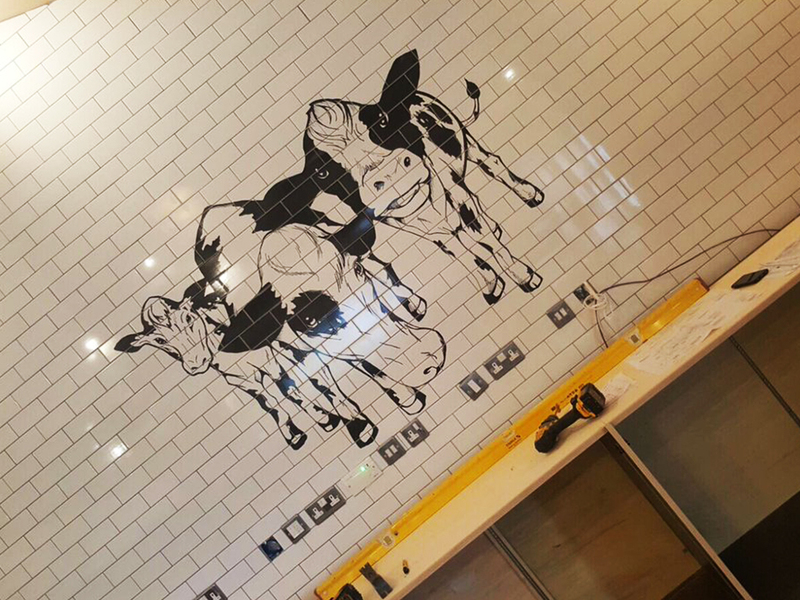 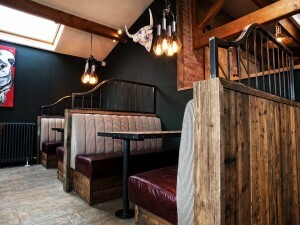 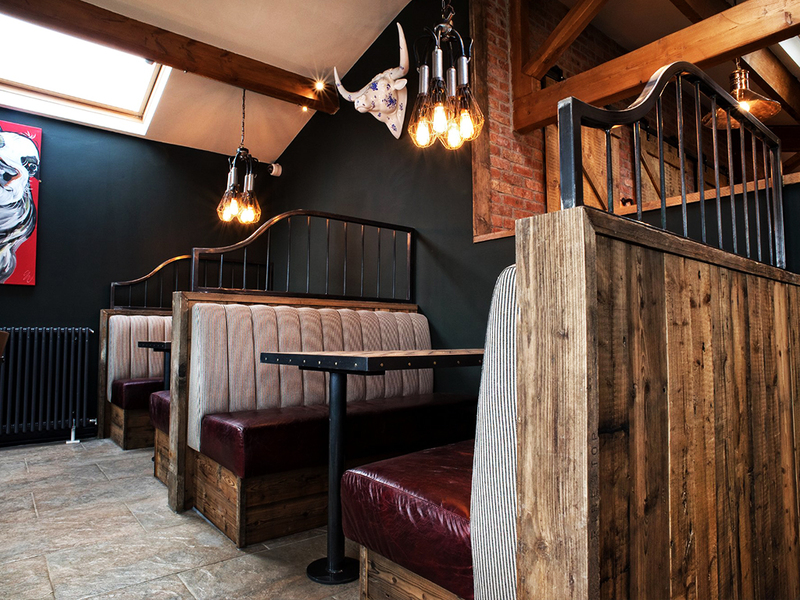 By using quality products like the brick slips that were supplied by brickslips.co.uk, and sourcing local materials they have been able to transform one of Yorkshire’s favorite café and ice cream parlors into a 80-seater Restaurant. The execution of this project has been triumphant injecting modern elements into a traditional farmhouse look and feel. 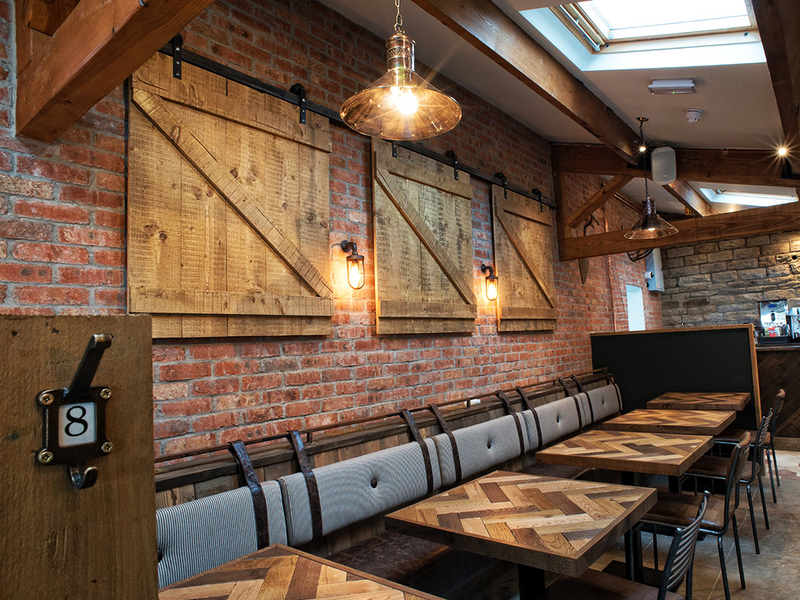 Famous for its artisan ice cream, the hide and hoof can now boast that it houses one of the best examples of Olde heritage brick slips in use.